Easy drop-in high flow charge air pipe (hot side), 2013+ Fiesta ST Turbo 1.6L. Constructed in U.S.A. from aluminum, 2Ó pipe diameter, all mandrel bend elbows, and TIG welds. Replaces charge pipe ÒbottleneckÓ sections between turbocharger outlet and stock rubber intercooler inlet hose with 2Ó diameter stainless steel high flow charge air pipe. Click here to view bottlenecks and charge pipe system diagram. Stock turbo compressor outlet diameter is 1.5Ó. Majority aftermarket turbo upgrades utilize 2Ó diameter compressor outlet. ATP Turbo high flow charge air pipe (2Ó diameter) is perfect for future big turbo upgrades; and compatible with stock turbo with supplied 1.5Ó to 2Ó silicone transition elbow. ATP Turbo high flow charge air pipe includes 1Ó side port for upgrade mechanical BOV (Tial, HKS, Greddy, etc.). Alternatively, stock electric diverter valve may be relocated to 1Ó side port (note, stock electric diverter valve integrated into stock turbo compressor housing). Upgrading stock turbo to Garrett GT/GTX turbo requires a high flowing mechanical or vacuum actuated valve to handle increased flow on throttle lift. 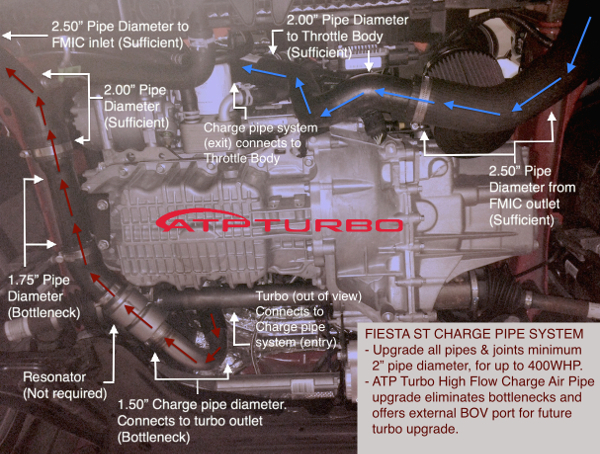 NOTE: ATP Turbo high flow charge air pipe NOT recommended or necessary for Fiesta ST owners without turbo upgrade plans. 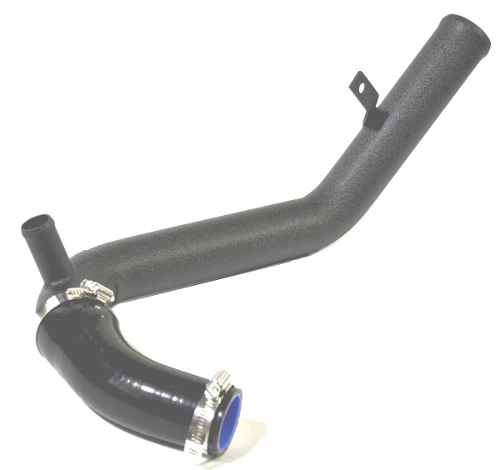 Stock charge pipe system provides adequate flow for stock turbo and bolt-on performance modifications. The choking point occurs at turbo outlet (1.5Ó outer diameter and slightly above 1.25Ó inner diameter). Alternatively, intercooler upgrade will yield better returns and greatly enhances performance from even the stock turbo. When using ATP Turbo high flow charge pipe and turbo upgrade (stock location), a 2Ó to 2Ó 45 degree silicone coupler is required; and you are ready to handle big turbo power up to 400WHP.